Is your guitar solo sounding a little off, are you wondering what you can do instantly that will massively improve your guitar solos? Maybe you wonder what makes a professional’s solo sound so much better than an amateur? We are going to address a few rookie mistakes commonly made by beginner and intermediate guitarist. If you can take these things on board and avoid them when you are soloing. Your solo is going to sound much better instantly. I see this a lot with beginner guitarists, where they play their solos with very little gap in between their phrases. This is like someone talking to you and not giving you any breathing space, just constantly talking to you. That’s what constantly playing the guitar is like. To make your guitar sound like you are speaking a language. You need to have phrases with good breathing space in between. So that you can form musical sentences. Pauses really help to add emotion and tension in your playing. When you are first starting out playing the guitar, you might find that due to synchronization of your left hand and right hand. Your note playing has gaps in between. It creates staccato sounding notes which are pointy sounding. Now sometimes you do want to create this sound, however. Doing it constantly can make your playing sound very amateur. Try to really listen to your playing and avoid having this void in between your notes. This will instantly make your solos sound a lot more pleasant to listen to. When you are bending your strings. Have you been considering what you are bending them to? Make sure that you are bending your notes to a note in the key and scale. (I won’t go into what this means, either ask your guitar teacher, or ask us if you are in London.) Getting your string bend to be in the right key and scale will mean it is in tune. Otherwise you can result in bends that sound like a cat dying. To practice getting your bends in tune, you can put a tuner clip onto the end of your guitar. When you bend your string, makes sure it goes into tune with the next note in the scale by checking on your tuner. A lot of beginners, when they improvise, they always start each of their phrase at the same beat of the bars. Whether that’s on the first beat, or the 3rd. This makes the improvisation sound more boring, and less exciting than if you had more variation in the solo. Try to start your phrases on a different beat of the bar by actively accounting as you play. And starting either slightly before or after the beat. The more you practice this, the easier you will find it to add variation to your solos by creating more interesting phrases beginnings. 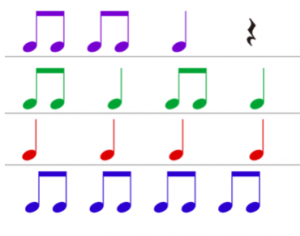 Similar to starting on the same beat of the bar, often beginners and intermediate players get comfortable with a certain rhythmic value, or a certain rhythm. And they will repeat that either in the same solos or even in multiple solos. Try to add more changes to your playing by increasing or decreasing the length of the notes held to add more interest. ving more interesting phrasing, nice sounding notes. It makes your solos sound that much more professional. Practice each of those elements individually, and then put them together to see how awesome your solos sound now. Improvisation can seem daunting, and confusing. It really just takes practice along with the right information. If you are wanting to improve your guitar playing, and improve the sound of your solos, then contact us to find out how we can help you. Click on the button below to find out more about how we can transform your guitar playing from the moment you say go.